Apparently every second or so person that this guy working in the Google Maps team knows can’t live without two things – their bike and Google Maps. So they decided to do something about the fellas that pedal their way through the country by including Bicycling directions in Google Maps. True story! Biking directions can help you find a convenient and efficient route that makes use of dedicated bike trails or lanes and avoids hills and busy intersections when possible. Bike-friendly roads also get an advantage and there is a new time estimate algorithm, based on the type of road, terrain and turns over the route. 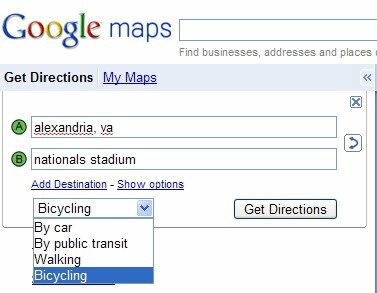 So what are your waiting for – plan a route, click “Bicycling” from the drop-down menu, grab your helmet (safety first!) and hop on the bike.